Today was our last day in Wyoming and not to say that we didn't like Wyoming but we were glad to finally get to Colorado. We only had 8 miles until the Colorado border and we decided to stop and take photos to mark our fifth state. 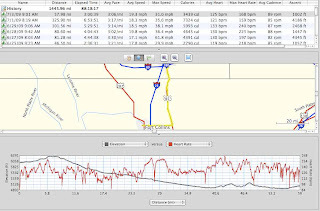 For the most part the ride was downhill and we had an awesome tail wind so we were cruising and managed to tackle most of the 55 miles before our 10 A.M. rack point. We rolled into Fort Collins and arrived at the Fo. Co. Pi Kappa Phi chapter house, Zeta Phi who had lunch for us. The team devoured several large subs from Silver Mine subs, a new favorite sub shop of mine. We took a tour of their house and mingled until an afternoon shower persuaded us to get on our bikes and ride the few miles to lodging. We stayed at the Fort Collins Senior Center which was a great facility with a good location. We all showered up and ate a second lunch provided by our project manager who ordered 27 Jimmy Johns Subs, its never ceases to amaze me how much we can eat. Our scheduled friendship visit at 5 had been bumped up to 3 and we were all excited to play some games and eat some pizza with ARO, the organization we were working with. Playing Keep the Balloon UP! The team had a great time at the friendship visit playing several ice breakers first and then relay races and a few other fun activities. The members of ARO had a wonderful time and we were all glad to meet and spend time with them. After the friendship visit we made bike shop runs and ran necessary errands before evening activities. We had to carry on our tradition of eating ice cream everyday so we made a trip to dairy queen for a cookie dough Blizzard, and then over to a Mexican place for some fish taco's before the movie.We decided to go see the movie Public Enemies with Johnny Depp and Christian Bale, I liked the movie a lot but some of the guys thought it was too slow. It was another great day on the Journey and were all excited to ride into Boulder tomorrow for a day off! Posted by Unknown at 8:56 PM I'm reading from MyDailyGround: Fort Collins Tweet this!